Is the recipe simple, is it difficult? Depending on how much time I set aside for a recipe, I usually head towards an easy recipe, especially if we have guests coming over. If I see a luscious dessert, I have to make it. 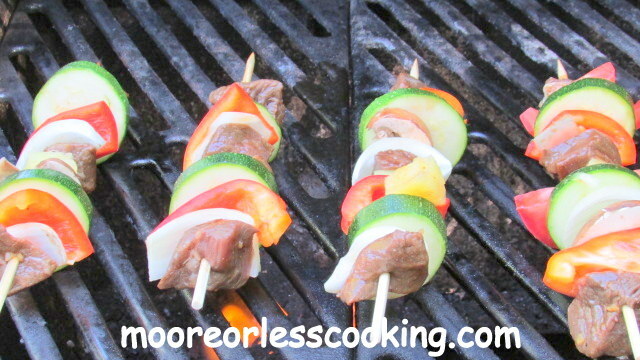 If I see juicy Beef with Vegetables Kabob, you betcha, I am going to try to make that! 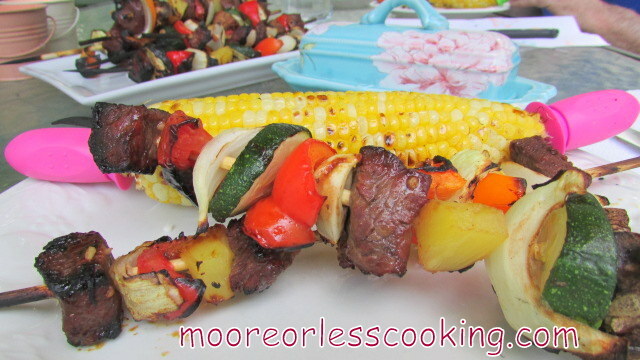 I saw the photograph from my friend, Cooking from a SAHM’s kabobs (AND DROOLED) and had been thinking about them for a while. The photograph was shared on facebook again, that was it! I found all of the ingredients that I wanted to build on my kabob sticks. This is a creative outlet, that is fun and delicious, you be the master chef and decide what to build for your kabobs. My choices FOR THE BEEF KABOBS. Put all these ingredients in a bowl and whisk. Add your steak tips and marinade for 2 hours. Soak your wooden sticks in water for about 2 hours or so. Chop all your vegetables (plus pineapple) into chunks. Stick Meat and Vegetables and pineapple on stick. 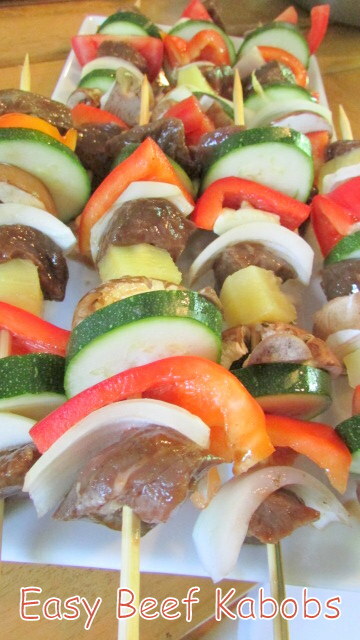 This is the order that I skewered for the kabobs: Meat, Onion, pepper, pineapple, mushroom, garlic, zucchini. 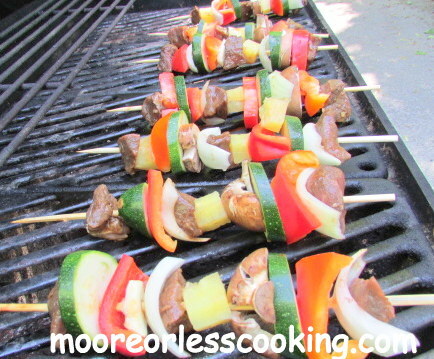 Repeat until all meat and vegetables are on the skewers. 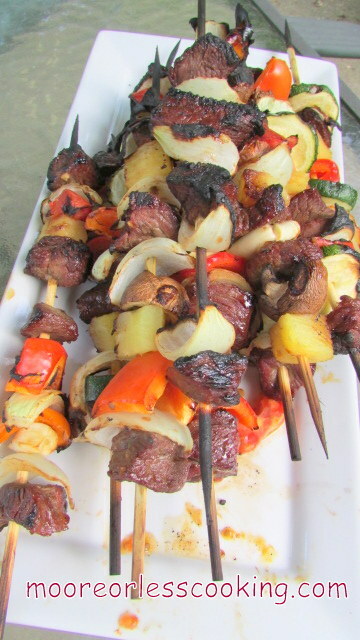 Grill on a medium high flame, move kabobs to top rack to keep warm while cooking the rest of the kabobs. Grill the meat to your liking. HI Nettie, love the simple recipes. Such a fun and easy idea for a BBQ. 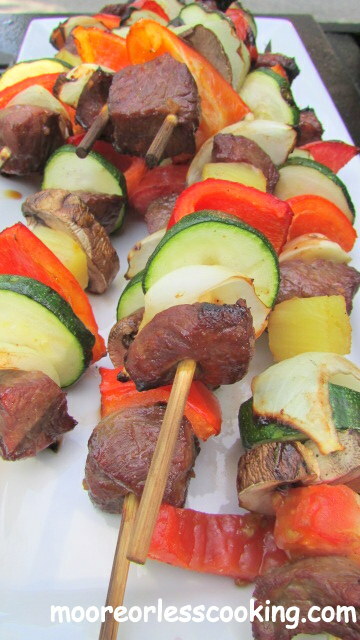 These #BeefKabobs are on my “to do” list. (I would put that cherry coke in the recipe as a “Zing Factor!”. 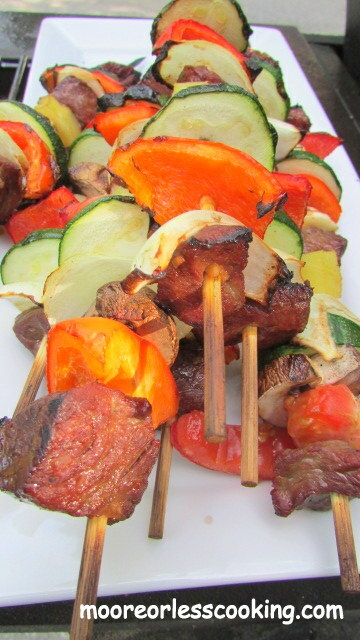 These kabobs look amazing Nettie. That glaze has me drooling all over my keyboard!